The Daeodon (dee-o-don) is one of the Creatures in ARK: Survival Evolved. Daeodon comedentis is the largest known species of Entelodont, an omnivorous family of ancient mammals that are sometimes referred to as "Hell Pigs." Even though Daeodon has as many similarities to modern Hippopotamidae as it does to Suina, I've found that to be a suitable nickname. Daeodon is as mean as it looks, and any survivor who wanders too close will find that out the hard way. As an omnivore with a voracious appetite, Daeodon scavenges, forages, and hunts to survive. It has little qualms when it comes to its diet, and that has helped it thrive on the Island's harsh tundra. Its temper hasn't hurt either, as many would be predators would rather seek out less vicious prey. Travelers of the Ark will typically find Daeodon travelling in packs, devouring anything and everything that gets within sight. Once combat is initiated one or sometimes all of the pack will produce a pheromone effect to buff the health regeneration of friendly creatures. 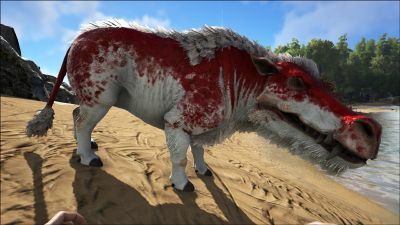 This, boosted by the other wild Daeodon's passive health boost, can make a pack of these dinos a very deadly opponent. It does appear however, if a traveler happens upon a lonely Daeodon, at least upon the traveler hitting the creature, it will run from the fight rather than stick around. The Daeodon is very useful in Boss Arenas to heal your tames. Daeodon is a large mammal with hunched shoulders and cloven hooves. It has a massive head and long jaws with fearsome tusk like front teeth for tearing both meat and plant matter and rows of molars at the back of the mouth for grinding. With its massive size and nightmarish teeth, it is easy to forget this animal is part of the pig family. This section displays the Daeodon's natural colors and regions. 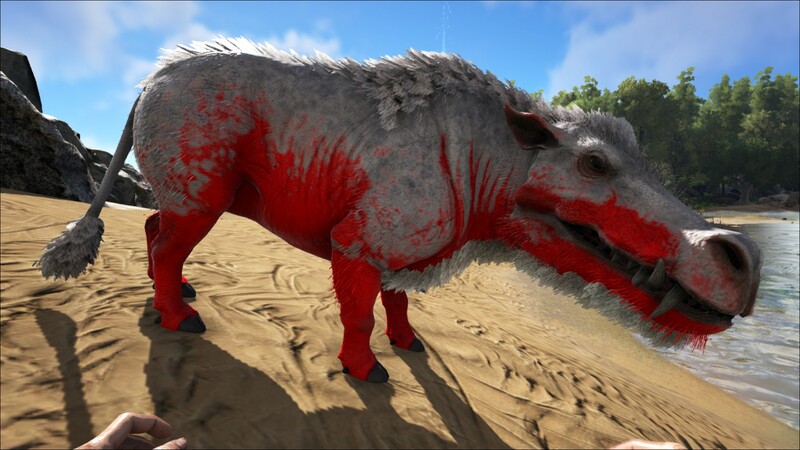 For demonstration, the regions below are colored red over an albino Daeodon. The colored squares shown underneath each region's description are the colors that the Daeodon will randomly spawn with to provide an overall range of its natural color scheme. Hover your cursor over a color to display its name and ID. For example, "cheat SetTargetDinoColor 0 6" would color the Daeodon's "underside" magenta. Daeodon very rarely travel alone. Groups typically consist of 2-4 individuals with an equal ratio of male to females, making the mate buff a very realistic threat to the survivor. In addition, it is a common sight to see half of the group being a higher level than the other half (i.e. Level 60 male and a Level 10 female). The winter tundra contains large, and often deadly prey such as Mammoth. This means that Daeodon will often take advantage of their healing abilities to soak up damage in order to stay alive. Take these key points into consideration when tackling any Daeodon. Ensure you note the total number of Daeodons in a group before attacking, as well as any other threats that may be lingering nearby (e.g. Direwolf). If attempting to kill, simply stand on a high position and shoot at it, or use a bola to keep it still and attack it with a sword or pike. When fighting a group of Daeodon, be sure to kill the weaker ones first in order to reduce the efficiency of the healing buff. This will ultimately make fighting against the higher levels a lot easier. Strong tamed creatures also work very well. Use shields if attempting to attack it with melee weapons, while crossbows can be used for long range, aiming for its lower jaw counts as a headshot. As they often appear in groups, the player can be very quickly overwhelmed. Furthermore, a larger group means a larger mate and healing buff, resulting in a very quick and inescapable death. These creatures are also capable of fast speeds. Long range attacks render the Daeodon harmless, particularly if they are alone. The Daeodon is an aggressive creature; keep your distance when shooting, Longneck or crossbow is preferred. It can be grabbed by an Argentavis so one player can grab it while the other one at the ground shoots it. If playing solo, trap it inside a small house with the help of an Argentavis or using ramps. It cannot fit through doors so you can stand outside while shooting it safely. Be aware that the Daeodon has an enormous appetite. Carry a lot of food for taming, you'll need it! Before you knock it out try to make it use its healing attack; it will make it lose a lot of food. Then knock it out. If you use mutton, it will require much more of it than other creatures typically do, so be sure you have plenty. On Scorched Earth, put preserving salt in its inventory as well to make the mutton last long enough to complete the tame. Raid healer: Its AOE pulsating Heal makes it valuable for healing your dinos during a raid on a base! (Level Health and Food) If you want to give it Food faster use prime meat, it gives about 50 Food each and makes the Food go up fast. While healing, the Daeodon's food level will rapidly drain; be sure to bring it well stocked with food to eat. Keep in mind that the amount of dinos being healed by the Daeodon has a direct impact on the amount of food drained - healing many dinos at once can lead to thousands of food level draining every few seconds. It might be useful to carry some cheap kibble (such as dodo) because it provides more food and can be force-fed at once, unlike meat. The amount of healing gained per tick of the Daeodon's healing aura is directly linked to the maximum health of the dino being healed. Higher HP dinos will heal more HP per tick. Feces Producer: While in active healing mode Daeodon produces a large amount of feces in a short amount of time. Perfect for those who need a large amount of feces to compost into fertilizer. 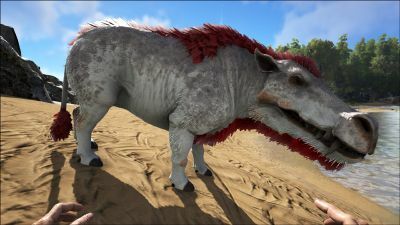 Cactus Sap Collector: The Daeodon seems to be a perfect creature to harvest Cactus Sap on Scorched Earth. It can only harvest sap from the low, red-flowered cactus bushes, not the tall saguaro cactus trees. Rare Mushroom Collector: The Daeodon excels at collecting rare mushrooms. When they attack plants that carry rare mushrooms (e.g., cattails on The Center or The Island, or purple flowers on Scorched Earth) they only get mushrooms, so there's no need to empty them of berries, seeds, and fiber. Dino Dossier revealed on 10/04/2016. The dossier says that Daeodon has as many similarities to modern Hippopotamidae as it does to Suina, this sentence refers to how many people call this creature "Hell Pig" even though they're a whole different animal, but still closely related to pigs and hippos; both are members of artiodactyl (even-toed ungulate). Although there was mention of multiple Daeodons receiving a pack bonus to their healing aura, there does not currently seem to be any benefit to multiple Daeodons healing at once. The dossier lists Daeodon as an Omnivore, but as of v257 the Daeodon will only eat meat. All berries and crops provide no food value. In addition, Raw Meat provides only 10 food value upon consumption (but cooked meat provides it 25 food value). The Daeodon has a different scale of foods as the rest of carnivores, that's the order (worst to best): raw fish 5 pts of food, raw meat 10 pts, cooked fish 12,5 pts, cooked meat, cooked prime fish and cooked jerky have 25 pts, cooked prime, cooked lamb chops and prime jerky have 50 pts of food. For cost/performance the cheapest and with good effectiveness it's the cooked meat, or you can use cooked prime meat as an expensive but more effective source of feeding it when you use its healing capability. There is a bug with the Daeodon's healing ability that causes it to constantly heal even when there's nothing to heal. If it ever occurs, just remove its food source and let it starve. Once it reaches zero the ability should stop and you can then give its food back. Until the bug is patched up, it is highly advised to NEVER use it. Otherwise you'll have a lot of food wasted. This can be countered if the daeodon has a saddle, as one can jump on and turn off the healing manually. Disabling passive healing may also fix this bug.